U.S. Army recruits can now get a jump on a Penn State education as the University has joined on to be a part of the Army's Concurrent Admissions Program (ConAP). ConAP is designed to help soldiers begin to talk with a university immediately after enlistment, so they can begin and potentially complete a bachelor's or master's degree while in the Army. Since distance education through online learning is the preferred method for soldiers to gain their education, soldier students can begin their education online through Penn State World Campus. All 24 of Penn State's campuses are participating in ConAP, so soldier students can complete a degree online or on campus. U.S. Army recruits can now get a jump on a Penn State education as the University has joined on to be a part of the Army's Concurrent Admissions Program (ConAP). ConAP is designed to help soldiers begin to talk with a university immediately after enlistment, so they can begin and potentially complete their degrees while in the Army. "Earning an education is one of the most important benefits to our soldiers," said Colonel Patrick Gawkins, first recruiting brigade commander for the Army. "We are excited to have Penn State participating in ConAP, because soldier students want and need a high-quality education to go along with their military training." When soldiers enlist in the Army, they are encouraged to choose from higher education institutions, like Penn State, who participate in ConAP. "ConAP soldiers have a plan for college from the time they enlist. We want soldiers to transition directly from the Army to college, and we expect many will enroll at a Penn State campus," said Ben Buckley, national director of ConAP. Penn State then supplies the soldier with the necessary admission information and options available for study. These efforts are coordinated between Penn State's Office of Veteran Affairs and a military admissions and advising team that is focused on online education. "Active-duty soldiers can now begin their education online and even complete their degree online through Penn State World Campus," said Ginny Newman, assistant director for military education at Penn State. "This is great for the soldier students, because it provides the flexibility to gain a Penn State education even when they move to different installations during their military career." While many soldier students choose online learning for their education, Penn State's ConAP agreement runs system-wide and includes all 24 of Penn State's campuses found throughout the Commonwealth. Bill Curley, executive director of statewide continuing education said, "ConAP opens all of Penn State's campuses to soldier students, and allows them to get started on a degree rather than having to wait until they separate from the Army. Providing this type of universal access to soldiers is great for both the Army and Penn State." CAPTION: U.S. Army Master Sergeant Stephen Krivitsky (left) carries the Penn State World Campus banner at All University Day in Beaver Stadium (PSU Photo -- Richard Ackley). Penn State World Campus specializes in adult online education, delivering more than 60 of Penn State's most highly regarded graduate, undergraduate and professional education programs online, through convenient distance education formats. Founded in 1998, Penn State World Campus is the University's 25th campus serving more than 7,000 students in all 50 states, 43 countries, and on 7 continents. For more information about Penn State's participation in distance education with the military through Penn State World Campus, visit the online military education page. 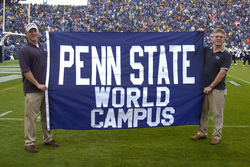 Penn State World Campus is a part of Penn State Outreach, the largest unified outreach organization in American higher education. Penn State Outreach serves more than 5 million people each year, delivering more than 2,000 programs to people in all 67 Pennsylvania counties, all 50 states and 80 countries worldwide.